I have been more than pleasantly surprised on the the performance of the Q-SPD system. The only previously available system for a boat this size have been Arnesons, and we all know the problems associated with these drives. 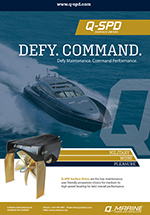 With Q-SPD drives we are very impressed with the maneuverability astern with predictable stern kick etc. The drives are fixed and the lack of having to adjust the trim as the boat gets on the plane is just something less to worry about. With fast holeshot times, even when fully laden at 65tonnes, trim is never needed and this system still produces surprising agility. With high speed cornering we were not scrubbing speed to excess and quickly pick up to full rpm and full speed, in our case 45kts at 2400rpm. Using MTU V16 2000hp we have been very impressed with this system. Copyright © 2019 Q-Marine International Ltd. All Rights Reserved.